» home » magazine » 2017 » september 2017 » new 800-ton hydraulic press slated for weldmac mfg. 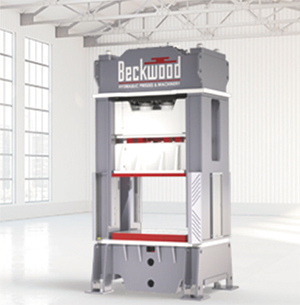 Beckwood Press Co. has contracted to supply Weldmac Manufacturing Co., El Cajon, CA, with a custom 800-ton triple-action press, which will be used to form high-strength alloys for the aerospace and defense industries. Scheduled for completion in early-2018, this equipment will supplement Weldmac’s existing 450- and 150-ton triple-action presses. To ensure rigidity and precision ram guidance, Beckwood will equip the press with an eight-point gib-guided system with fully adjustable self-lubricating graphite-impregnated bronze wear strips. The press features a 300-ton clamp ram with a 24-in. through-hole to secure blank material during downward draw-forming operations. To further control material flow, an operator can specify the tonnage on each of the four clamps’ ram cylinders independently. Once material is clamped, the 800-ton draw ram extends to form the part. A third ram in the press’ bed can be used as either a knockout or a cushion depending on tooling requirements. The clamp ram and knockout ram are regulated by proportional control valves allowing for dynamic cushion control through four different travel zones when used as cushions. Via the PLC, the operator can specify the cushion force for a desired amount of cushion travel.